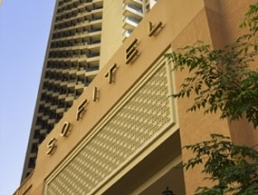 The Sofitel Dubai Jumeirah Beach hotel is a luxury 5 star Dubai hotel located in the heart of New Dubai in Jumeirah Beach Residence on the Walk, a lively, mile-long promenade with 200 shops, cafes and restaurants. Adjacent to Dubai Media/Internet City and Montgomerie Golf Club, and near Jebel Ali Free Zone, this luxury 5 star Dubai hotel has breathtaking views of the sea and Dubai Marina. Contemporary design, the latest technology and warm French savoir faire with an Arabic twist await you.